What little girl doesn't dream about tutus, flowers and sparkles? Luckily, this new Verve dress from Ooh La La Couture has both! Perfect for spring & summer, this adorable dress combines the fun of a fluffy, layered tutu with the shimmer and shine of a cute embelished v-neck bodice in a floral pattern. 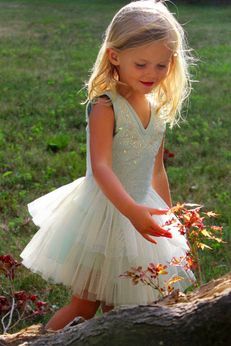 Your girl will adore soft, delicate blue color tutu skirt and the beaded rose-laden neckline.